Please Note: This post is from 2015–prior to the first ever carnival. Following that experience, I updated with a FAQ prior to the 2016 carnival, which can be found HERE. Following the 2015 event, I wrote a story about our experience HERE. 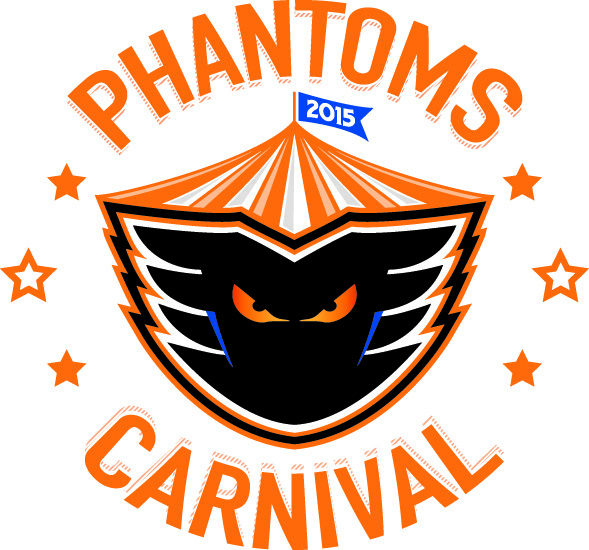 The Phantoms are planning a “carnival” for full-season ticket holders, and are asking us to “save the date.” There was no distinction made between 1-, 3-, and 5-year contracts, but the email I received today did specify “full season” ticket holders. The date to save is Friday, March 27. The hours to save are 5PM to 9PM. The event will be held at the PPL Center, and more details–and tickets–will be forthcoming. There was no mention of a “seat change event” in the email–for those of us who are looking to change location. Kram, I was waiting for seat change info too. Got impatient and went to the renewal table at a game two weeks ago and they were already upgrading. I only have a single seat but went from middle of upper level to 2nd row lower level next season! Hey great upgrade! Responses to this story over on the SpaceBook suggest that the seat-change event for Season Ticket Holders has already occurred. Emails were sent out, of which I did not get one. I’m not dying to change seats–in fact, my kids prefer that we stay put, so I probably will. There is a portion of this fan-base for the Phantoms, though, who are getting restless with the quality of the hockey and the play on the ice in contrast with some everything-but-hockey promotion from the organization. That’s not me, though. I know they have to keep on putting on games and interacting with the community regardless of wins and losses. What bothers me is the lack of quality communication from the organization. I asked twice, and both times was told, “you’ll get an email” and “just wait for the email” and I never received one. Yet, I’ve committed to 5 years of tickets with this team. That’s part of why I made this post–I got the email about the “carnival” and wanted to make sure that other season ticket holders know about it. The Phantoms as an organization can decide where to draw the line for events and benefits and whatnot: full-season vs partial, 1-, 3-, or 5-year plans–whatever. But at least they should TELL US. thats funny, we renewed our 5 yr club seats last weekend and she “made a note” that we wanted to move our seats (I cant stand looking thru the glass). agreed about the spotty communication. can only hope that they are learning as they go/grow. attending a flyer game last night made me appreciate PPL/Phantoms even more than i already did. tho i really loved their HOCKEY MOM of the game promotion! !